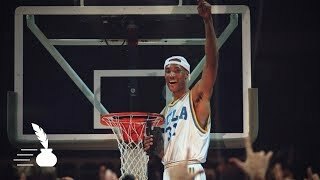 Ed O'Bannon led the UCLA men's basketball team to the 1995 NCAA Basketball Championship. He received the NCAA Tournament's Most Outstanding Player Award and won numerous other awards, including the John Wooden Award, which recognizes the best college basketball player in the country. O'Bannon was the ninth player selected in the 1995 NBA Draft and enjoyed a 10-year professional basketball career. After retiring from the game, O'Bannon entered the car dealership industry. In 2009, O'Bannon filed a federal lawsuit against the NCAA and Electronic Arts. In a landmark decision, which was upheld by the U.S. Court of Appeals, O'Bannon defeated the NCAA. O'Bannon received no compensation from the case. O'Bannon, who is from Los Angeles, now resides in Henderson, Nevada with his wife, Rosa. They have three children.